When the 1995-96 Ontario Hockey League season opened, Ottawa 67’s forward Alyn McCauley was coming off a discouraging season that included a 25 game scoreless drought. Tabbed as a potential top-10 pick in the NHL draft when the previous season started, McCauley’s stock dropped considerably. The New Jersey Devils selected the Gananoque native in the fourth round in June. McCauley spent the summer of 1995 working out and getting ready to help the 67’s rebound from a last place finish in the OHL’s East Division. The hard work paid off. McCauley scored 34 goals and 82 points to lead the 67’s to a 33-point turnaround and a first place finish in the division. McCauley won his first of two Red Tilson awards as the OHL’s top player and he points to his selection to represent Canada at the World Junior Championships as the turning point in his career. McCauley was one of just three OHL players who were selected to Team Canada after the training camp in Campbeliton, New Brunswick. Head scout Ray Payne was responsible for picking the players to bring into camp. He was limited by the 12 players who were in the NHL, including Chad Kilger of the Kingston Frontenacs. Forwards Craig Mills, the captain of the Belleville Bulls, and Jamie Wright of the Guelph Storm were also named to the team. Goaltender Dan Cloutier, who was a backup on the gold medal squad from the year before, suffered a shoulder injury before the final selection camp. The tournament opened on Boxing Day in Boston with a new format that included 10 teams for the first time. The teams were split into two pools where they each played three round robin games. The top team in each pool at the end of the round robin received a bye into the semi-finals while the remaining two teams in each pool played a qualifying round that crossed over with the other pool. Canada’s pool included Finland, Switzerland, Ukraine and the United States, who they faced in the opener on Boxing Day. 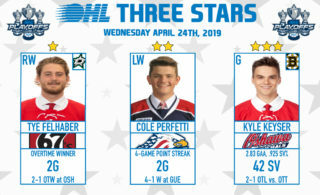 The Americans featured just one CHL player, Bryan Berard of the Detroit Jr. Red Wings. The Woonsocket, Rhode Island native was expected to be the top pick in the NHL draft and was named the U.S. team captain. They were coming off a disappointing fifth place finish in Canada the year before and wanted a better showing on home ice. Canada jumped out to an early lead when Jason Holland (Kamloops – WHL) scored 1:24 into the game and McCauley set up Jason Botterill for Canada’s second goal three and a half minutes later. The Canadians scored again in the first period and added a pair of goals in the second for a 5-0 lead after two periods. They traded goals in the third period and Canada stunned the Americans 6-1 in front of a crowd of more than 10,000 fans at the Centrum in Worcester, Massachusetts. Canada returned to the ice the net day in what they expected to be a cakewalk over Switzerland, who was making their return in the main pool after being relegated to the B pool two years earlier. McCauley and Wright combined to open the scoring midway through the second period for Canada, who was clearly suffering from a letdown after the big win against the U.S. in the opener. 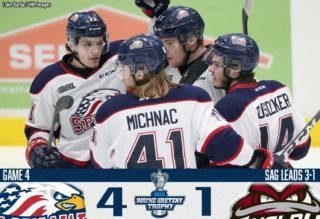 The Swiss evened the score 9:11 into the third period before Christian Dube (Sherbrooke – QMJHL), who played minor hockey in Switzerland for 12 years while his father coached there, scored the go-ahead goal 2:22 later. 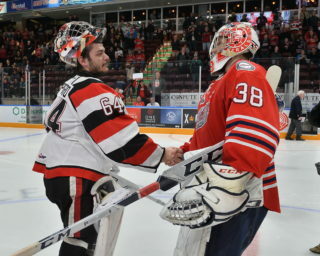 Goaltender Marc Denis (Chicoutimi – QMJHL) made 15 saves in the final period, including three spectacular saves late in the third period to preserve the win. Even though Canada didn’t get the effort they wanted against Switzerland, they did the get the result they needed. Their next test was against Finland, who also won their first two games, with the winner likely to finish the round robin in first place and earn the all-important bye in the semi-finals. Team captain Nolan Baumgartner (Kamloops – WHL) opened the scoring on a powerplay with 2:37 remaining in the first period. Dube added a second period goal before Finland got on the board with 5:01 left in the game. Jarome Iginla (Kamloops – WHL) added an empty-netter in the final minute to give Canada a 3-1 win. McCauley opened the scoring with his first of the tournament and added an assist on a third period marker as Canada coasted by the Ukraine 8-1 on New Year’s Eve to finish the round robin with a perfect 4-0-0 record. The Russians finished the round robin with a 2-1-1 record before beating Finland in the quarterfinals 6-2. They were led by offensive star Sergei Samsonov, who led the Russians on a barnstorming tour across Ontario earlier in the year. He was a top rated prospect for the 1997 NHL draft and a future rookie of the year. Samsonov was the center of some controversy during the early part of the tournament after playing very little in the opening games. 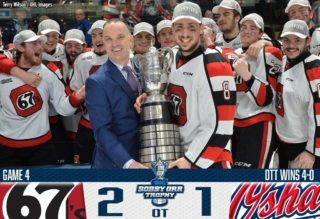 The Russian coaches said he was suffering from the effects of the flu, but the media were speculating that Samsonov, whose CHL rights were owned by the Ottawa 67’s, was being punished for selfish play. The Russians were without Alexander Volchkov, a star forward with the Barrie Colts, and a top NHL prospect. Volchkov wasn’t invited to play for Russia because he left his homeland to play junior hockey in Canada. Jason Podollan (Spokane – WHL) opened the scoring for Canada with the man advantage in the first period before the Russian capitalized on a powerplay less than three minutes later. The game was tied after 20 minutes, with the Russians holding a 19-10 advantage on the shot clock. Canada added another powerplay marker midway through the second period before Podollan gave Canada a 3-1 lead with his second of the game. The Russians responded before the period ended and trailed by one heading into the third period. Iginla restored Canada’s two-goal lead with a short-handed marker 6:40 into the third and Canada held on for a 4-3 win and a trip to the finals. Daymond Langkow (Tri-Cities – WHL) scored twice, including the opening goal 1:36 into the first period, and assisted on another to pace Canada to a 3-1 lead after two periods. Iginla, who was traded to the Calgary Flames for former National Junior Team member Joe Nieuwendyk, assisted on all three of Canada’s goals. McCauley iced the game midway through the third period on a nice feed from Wright on the final goal of the tournament. Canada won 4-1 to clinch their fourth straight gold medal. The win also gave McCauley, who finished the tournament with two goals and two assists, a newly found confidence that helped him turn his hockey career around. The team motto throughout the tournament was “Find a way.” McCauley helped them do just that.